TROX understands the art of handling air like no other company. Since its foundation in 1951, TROX has been developing and manufacturing sophisticated components, units and systems for ventilation and air conditioning as well as for fire and smoke protection. Dedicated research and development have made TROX a global leader of innovation in these fields. Demand-based office solutions of the future. When we talk about the office of the future, IAQ, or indoor air quality, is only one concept that comes to mind. More often than not, we talk of IEQ, or indoor environmental quality. With regard to IEQ, it is the goal of each specialist consultant and architect to create a perfect environment with the best possible working conditions and the best possible room air conditions. Over the past few decades TROX has gained much experience in office buildings and cooperates with the most creative and best engineers and architects to develop demand-based ventilation and air conditioning strategies that take the relevant criteria for each building into account and meet the requirements of its occupants. 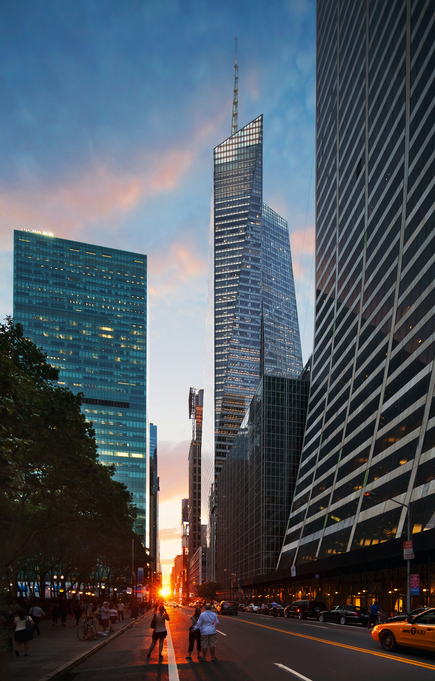 These development efforts have resulted in sustainable solutions that increase the well-being of people working in offices. In fact, scientists have been able to prove that, in addition to psychological factors, good room air has a positive and not to be neglected effect on performance levels. Brochure "Fresh air for offices"
From fans and air handling units to efficient filters, and from effective fire protection and smoke extract systems to air terminal devices, air-water systems and intelligent control components: The TROX portfolio comprises the entire spectrum of ventilation and air conditioning components, units and systems. We can hence provide our customers with complete solutions, not least for office buildings. 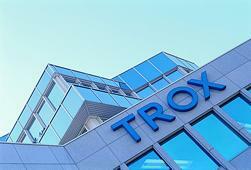 All TROX components, units and systems are engineered by TROX and ideally complement each other. Everything from a single source reduces the design and coordination effort considerably. Ventilation and air conditioning centre around people with their demands and needs. This is why we are committed to develop effective solutions in order to ensure maximum comfort and safety for people. Ensure a sufficient fresh air flow rate. Discharge the air to the occupied zone with as little turbulence and noise as possible. Filter fresh air to keep fine dust, pollen and other contaminants away. Provide individual air quality control and high thermal comfort. And last, but not least, link components intelligently, thereby ensuring their efficiency at all times. Researchers in Berkeley, California, studied the interrelation of indoor environmental quality and occupant performance and calculated the resulting economic benefit. The researchers have actually been able to show that increasing the supply air flow rate in offices may lead to an increase in performance levels by up to 4 % (Fig. 1). By far more interesting, however, are the findings regarding the satisfaction of room occupants since their expectations and general constitution greatly affect how they perceive the quality of the room air. The higher the supply air flow rate, the more people are satisfied, and then significantly (Fig. 2) – this is an immensely important aspect since motivation and well-being, but also the sick leave rates (reduction by up to 35 %), correlate to a large extent with employees' satisfaction. And yet the modernisation of ventilation and air conditioning systems is often delayed since it incurs high investment costs. Increasing the fresh air rate is often delayed, too, due to the higher energy consumption. The impact of good office air on a nation's economy cannot be denied: US researcher William J. Fisk carried out a cost-benefit analysis and has been able to prove that the economic benefit by far exceeds the investment into good room air quality. Studies suggest that if all office buildings in the US were refurbished (flow rate adapted to 10 l/s per person, room temperature of 23 °C max. in winter, further technical measures), the annual benefit to the US due to better performance in the workplace and fewer absences due to sickness would amount to USD 20 billion. 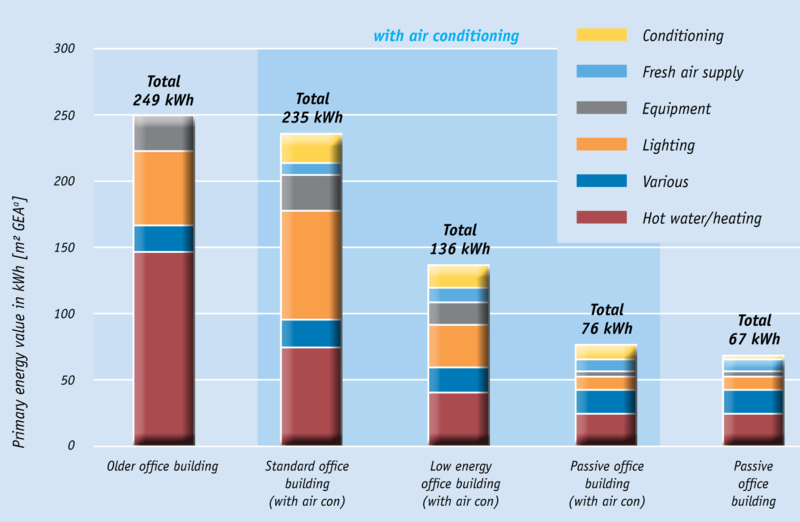 The air conditioning strategy for an office building depends on many factors. It begins with structural conditions such as architecture, building envelope, location and orientation, and the layout and size of rooms. Next, occupancy, loads to be dissipated, and the usage and equipment of offices all play an important role. And finally, the air conditioning system depends on whether it is designed for a new building or for a refurbishment. Existing buildings, i.e. refurbishment projects, do obviously not provide the same degree of planning freedom as new builds. The wide spectrum of air conditioning systems, units and components puts TROX into a unique position: being able to provide a bespoke solution for different conditions and for each office building. The sheer number of proven solutions, and the extensive expertise that TROX engineers have built up over the years and by working on the most diverse projects all over the world, provide our customers with tailored air conditioning systems and hence a very good room air quality. The prestigious reference projects we introduce in this brochure are proof of that. 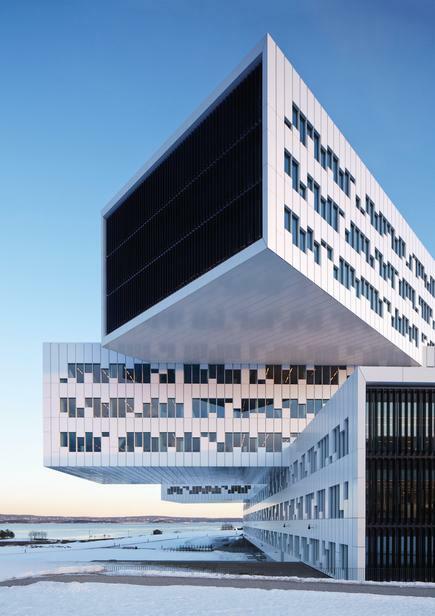 Many architects prefer open and transparent building structures and would like to integrate ventilation and air conditioning systems as unobtrusively as possible. Components are either hidden in ceilings, walls or façades; or they may be openly presented. Either way, suspended ceilings are no longer an issue for architects. Other reasons for omitting suspended ceilings are the saving of costs and a trend towards thermal component activation. Pipes for heating or cooling media, usually water, are laid in ceilings and walls, affecting phase changes and helping to smooth or shift peak loads. Component activation is best combined with regenerative heating and cooling systems, e.g. a heat pump. 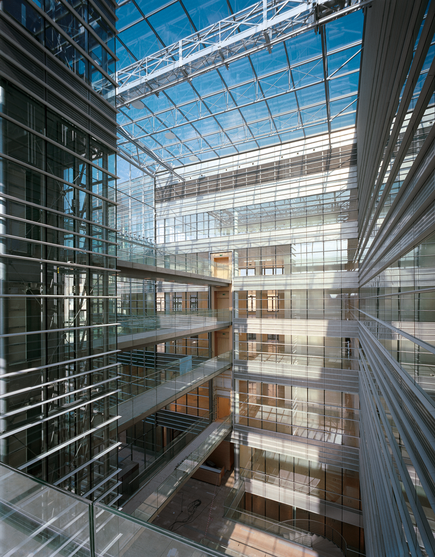 Ventilation and air conditioning should be flexible enough to allow for changing uses, particularly of office buildings. Ideally, control strategies take the weather forecast into consideration. Another trend that restricts air distribution through a suspended ceiling is the increasing number of refurbishment projects. Rooms of refurbishments are usually not high enough to accommodate a suspended ceiling. It is up to manufacturers such as TROX to develop flexible air distribution systems that can be adapted to different conditions. Combination diffusers installed in walls between rooms and corridors are an excellent choice. Demand-based control is characterised by large fluctuations of the supply air. For the best results, however, diffusers require a certain minimum volume flow rate. If the volume flow rate is lower than the required minimum, it may happen with temperatures below the room temperature that, due to the low velocity, the airflow suddenly detaches itself from the ceiling, and the supply air falls vertically into the occupied zone, causing draughts there. One way to avoid this is by increasing the number of blades of swirl diffusers such that they may also be used with lower volume flow rates. The most important criterion when deciding between an all-air system and an air-water system is obviously the cost, apart from the fresh air requirement [in m3/h.m2] and the cooling load [in W/m2]. 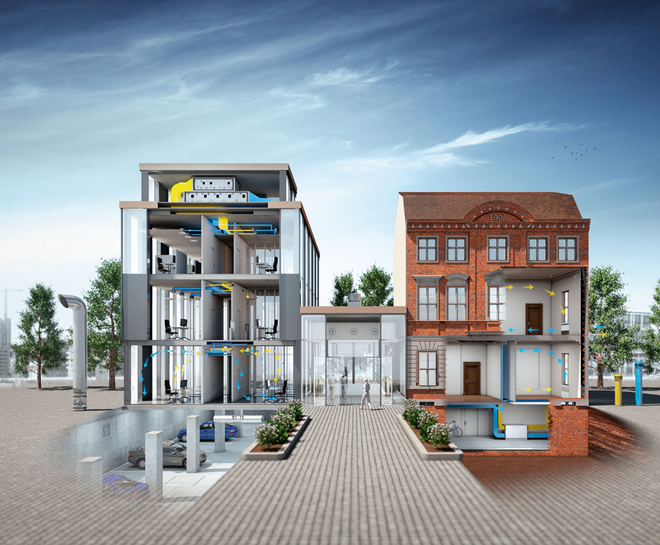 If one takes into account how much space is saved, the differences in the life cycle costs for all-air systems and air-water systems are small. In rooms with many people, good air quality can only be achieved with a sufficient fresh air volume flow rate that is based on the number of these people. This is usually an argument in favour of a classical all-air system. 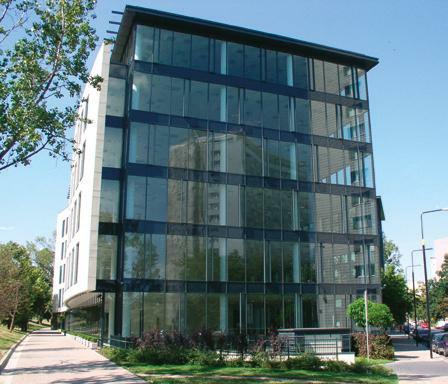 Modern office and administration buildings contain much technical equipment and often have large areas of glazing. The heat emitted by the equipment plus the solar gain due to large windows may heat a room considerably without the air quality being impaired by contamination. An all-air system would require large volume flow rates for cooling such rooms and incur high energy costs for air treatment and air transport. In this case air-water systems and decentralised ventilation systems with an integral air-to-water heat exchanger are the preferred choice since the heating and cooling capacity of these systems is independent of the fresh air flow rate. An additional advantage of air-water systems is the fact that thermal energy is transported more efficiently by water than by air such that less energy, and less space, is required to provide the same heating or cooling capacity. Renewable energy for ventilation and air conditioning. 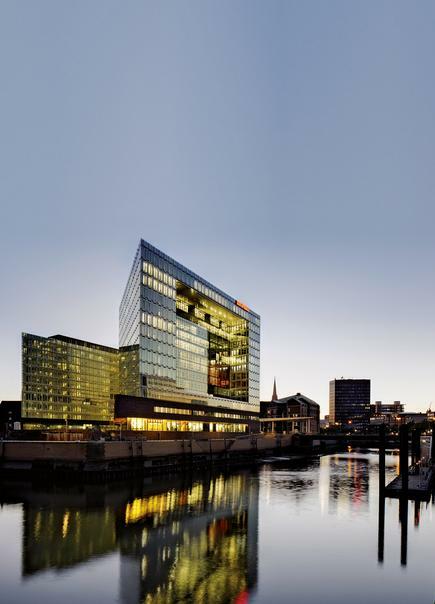 The savings potential for office buildings is considerable when state-of-the-art ventilation and air conditioning systems are used and when outdated components and systems are replaced. Constant volume flow systems provide a constant volume flow rate. This is why they can only be used when the air conditioning system is not used for heating, i.e. when temperature control for individual zones is achieved with other systems (e.g. radiators), when no temperature control is required at all, or when the air quality does not vary much. Constant volume flow systems are a typical choice for rooms where the usage does not vary within a day. Call centres are a good example: They are always staffed with the same number of peope, who work in shifts, 24 hours a day, 365 days a year. 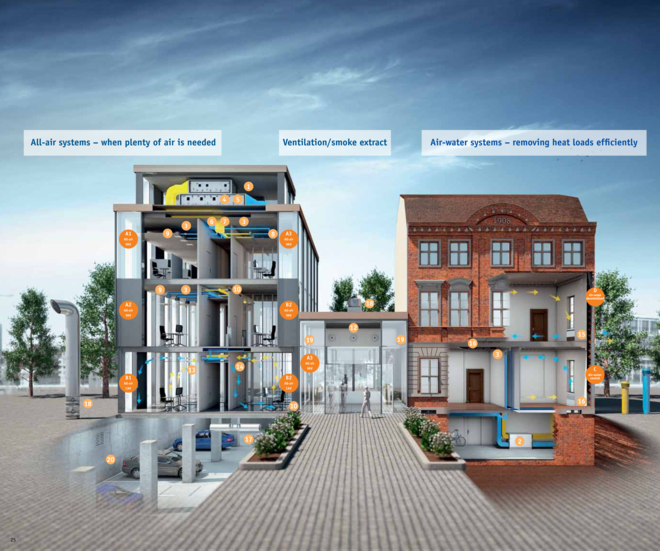 Demand-based ventilation with variable volume flow systems. 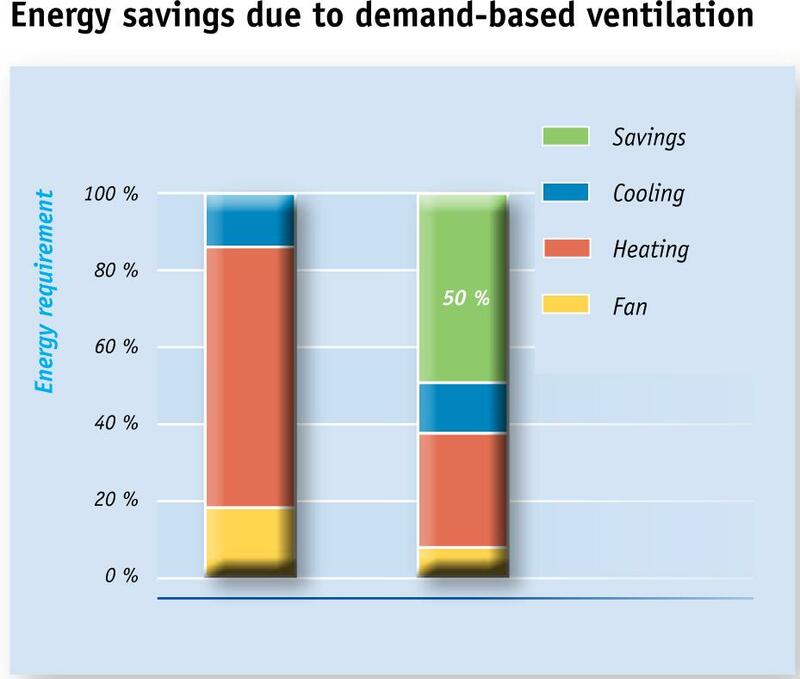 and conditioning air (heating, cooling, humidifying, dehumidifying) is always adapted to the actual demand. People will feel equally comfortable as long as the temperature and humidity levels lie within a certain range. This fact is made use of by intelligent control strategies, which select the best possible combination of values based on energy efficiency. Demand-based control is characterised by large fluctuations of the supply air. For the best results, however, certain diffusers require a minimum volume flow rate. Combination of constant and variable volume systems. It may be possible to have areas with constant volume control and areas with variable volume control, or to use air distribution systems with different sections for constant volume flow and variable volume flow. 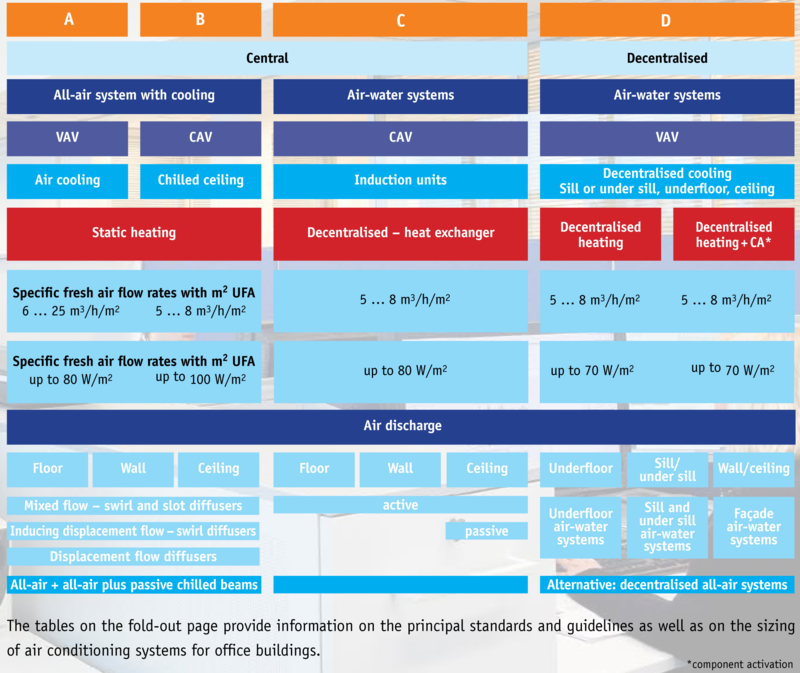 For example, meeting rooms on different floors but at the same place in the floor layout may be connected to a separate all-air air handling unit, which allows for individual variable volume flow control based on the usage and occupancy, while the standard offices have all-air systems with constant air volume control or air-water systems. When selecting a supply air diffuser, the exact installation location is as important as the cooling load of a room. If one compares a room air conditioning system to a chain, air terminal devices would be the most critical links for thermal comfort. They are supposed to ensure that the occupied zone meets the most demanding requirements of thermal comfort: Room air conditioning is perceived as ideal if you cannot hear it or feel it. Mixed flow or displacement flow ventilation? With mixed flow ventilation, a uniform temperature and air distribution are quickly achieved. The supply air is discharged with a velocity of 2 to 5 m/s, mixes with the room air and dilutes in this way the contaminant concentration. Turbulent mixed flow ventilation can achieve higher air change rates and better room purging. It is the preferred solution for areas with a high occupancy level and for areas where the air conditioning system is also used for heating. Displacement flow ventilation is characterised by low airflow velocities, low turbulence and a high air quality in the occupied zone. The supply air is discharged into the space with a low velocity and as close as possible to the floor; the result is a pool of fresh air over the entire floor area. The convection from people and other heat sources causes the fresh air from the pool to rise and create comfortable conditions in the occupied zone. An inducing displacement flow combines the advantages of both types of ventilation. The supply air rises in the near zone of displacement flow diffusers with a velocity of 1 to 1.5 m/s and mixes with the room air. Once the momentum of the jet dies out, the jet becomes a displacement flow. Due to the low levels of turbulence both inducing displacement flow ventilation and displacement flow ventilation meet the requirements of room air category A. Central vs decentralised air conditioning systems. Central air conditioning requires ductwork and hence space. This space is usually not availabe with refurbishments. 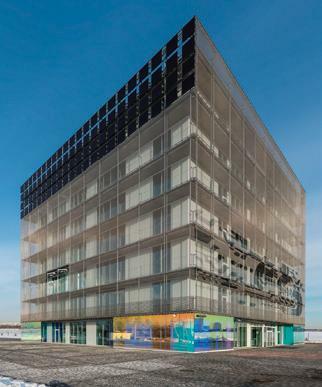 In such cases the perfect alternative for both refurbishments and new builds are decentralised façade units. The fresh air connection is provided by ventilation openings in the façade system or external wall. Decentralised ventilation and air conditioning units are suitable for rooms with a depth of up to seven metres, depending on the room layout and furniture. 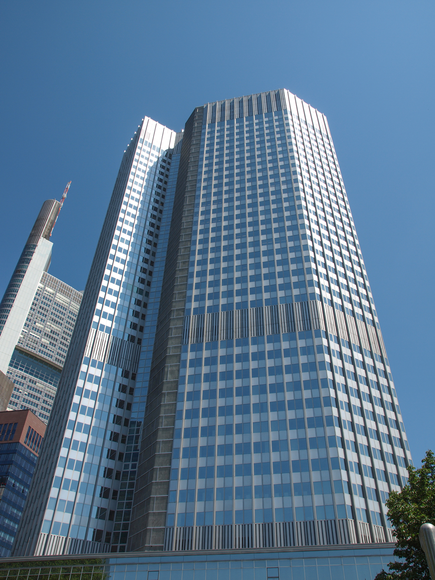 Given the sheer number and diversity of ventilation and air conditioning components, units and systems for office buildings, standards such as VDI 3804 provide valuable guidance for specialist consultants in Germany and beyond. TROX has set itself the goal of minimising interface issues with regard to components and trades. This is why we offer all ventilation and air conditioning components, units and systems from a single source: from air handling units to air terminal devices and to automation and communication systems. The decisive advantage for specialist consultants and HVAC contractors is the fact that they have only one point of contact; this reduces the communication and coordination effort considerably. 1. X-CUBE air handling units, are configurable and handle volume flow rates of up to 86,000 m³/h (24,000 l/s) for the ventilation and air conditioning of rooms – including filtration, heating, cooling, heat recovery, and humidifying and dehumidifying. 2. X-CUBE compact is a compact air handling unit for volume flow rates of 600 to 6000 m³/h and a heat recovery efficiency in excess of 80 % (dry, to EN 308); it is the ideal solution for small and medium-sized applications. 3. VAV terminal units combined with the X-AIRCONTROL zone control system provide demand-based volume flow rate control to ensure the best possible room air quality and temperature while they help to save energy at the same time. 4. Medium filters M5 are used in ventilation and air conditioning systems to separate contaminants from the air. 5. Fine dust filters F7 are used for the separation of fine dust in ventilation systems that have to meet demanding requirements. TROX filters of filter classes M5 to F9 are tested to EN 779 and certified by EUROVENT. 6. TROXNETCOM makes use of decentralised, open communication systems and hence allows for inexpensive fire protection solutions that can be easily integrated with the central BMS. 7. Fire dampers from TROX are certified for all European countries and prevent fire and smoke from spreading through ventilation ducting. The fire area is consequently shut off from other parts of the building. 8. Slot diffusers provide efficient air discharge and can be subtly integrated into suspended ceilings. 9. Swirl diffusers with optimised acoustic and aerodynamic properties come in a wide range of designs and constructions to suit every architectural requirement. They may be installed in suspended ceilings or just below the ceiling and hence visible. 10. Single ventilation grilles and continuous horizontal runs with adjustable front blades may be installed in walls and in circular and rectangular ducts. 11. Displacement flow diffusers provide a low-turbulence supply air flow at a very low discharge velocity. 12. Jet nozzles throw the air far into the room. The nozzles are actuated electrically, manually, or with an SMA actuator (self-powered) and can be operated in heating or cooling mode. 13. Combination diffusers for mixed flow ventilation are space saving diffusers used for both supplying air and extracting air; they can be installed in walls. 14. Combination diffusers for displacement flow ventilation are used for both supply and extract air and provide a comfortable displacement flow. 15. 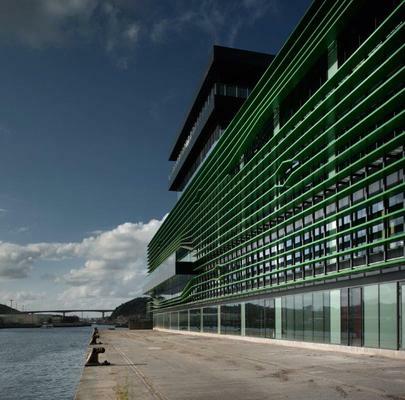 Decentralised ventilation units can be integrated with façade systems. State-of-the-art control technology and energy-efficient heat recovery systems ensure ideal room ventilation. 16. X-BEAM induction units are air-water systems and represent energy-efficient solutions for the ventilation and air conditioning of rooms. Ceiling mounted units can be fitted with additional functions or building services, e.g. lighting. 17. X-FANS jet ventilation systems are an excellent alternative to duct-based ventilation and smoke extract systems for underground car parks. 18. X-FANS smoke exhaust fans remove hot fire smoke in the event of a fire, allow people to move to safety, protect property and make it easier for firefighters to put out the flames. They can also be used for ventilation purposes. 19. Smoke control dampers with extract ventilation function, for smoke extract with mechanical smoke extract systems. 20. Tunnel and industrial dampers are used for the ventilation and smoke extract in underground transport systems and car parks.